If you suffer from adrenal fatigue, you may find help through an adrenal fatigue diet. Adrenal fatigue is a chronic medical condition that can affect many aspects of your health and well-being, including your ability to maintain your current weight or lose weight. Fortunately, by making lifestyle and dietary changes, you can combat and even reverse adrenal fatigue. Before considering an adrenal fatigue diet, it is essential to establish that adrenal fatigue is present. Adrenal fatigue isn't a disease; rather, it is a syndrome that is a collection of symptoms that frequently occur together. In the case of adrenal fatigue a certain group of symptoms occur when the adrenals don't function at optimal levels. Though a number of symptoms are associated with the syndrome; one of the main symptoms is fatigue that is unrelieved by sleep. Other symptoms include weight gain or the inability to lose weight due to the presence of excessive cortisol in the body and recurring infections. How Does Borage Oil Affect the Adrenals? Adrenal fatigue can be caused by both physical and emotional stresses including poor diet. This is why one of the primary cures for adrenal fatigue includes lifestyle and dietary changes that allow your adrenals time to heal. The goal of a diet for adrenal fatigue isn't weight loss. Instead, it is to provide your body with the healthiest foods possible in conjunction with moderate exercise, stress reduction, and plenty of rest so your adrenals have time to heal and begin working properly. About 35 percent of your daily calories should be from uncooked or lightly cooked vegetables. Another 35 percent of your daily calories should come from whole grains such as brown rice and oats. 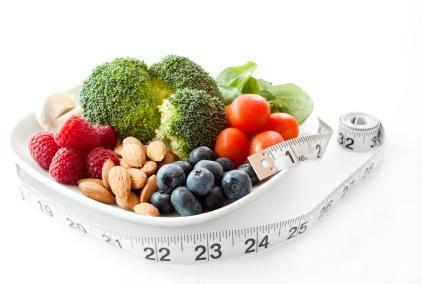 Twelve percent of your daily calories should come from legumes, seeds and nuts. Another 12 percent of your daily calories should come from lean animal proteins. About six percent of your daily calories should come from fruits. Unless you have high blood pressure, you should lightly salt some of your foods - preferably with sea salt. You should drink plenty of water - at least eight 8 oz. glasses per day, as well as green tea and herbal teas. Include Omega-3 fatty acids in your diet in fish or as fish oil. Try to eat mostly organic, minimally processed foods. Blood sugar issues often accompany adrenal fatigue, which is sometimes associated with diabetes and Syndrome X. Because of this, you need to eat breakfast, lunch and dinner along with two high quality snacks. Most food should be consumed between the hours of 7 a.m. and 6 p.m.
How you eat is also important in combating adrenal fatigue, because your body needs to be able to digest your food and absorb the nutrients from the food with the minimum amount of stress. Because of this, you need to make sure you make time to eat rather than eating on the run. Sit down at the table and consciously eat your food, making sure to carefully chew your food fully before swallowing it. Managing your diet for adrenal fatigue may seem like a chore, but the benefits are well worth the effort. By working with your health care provider to make diet and lifestyle changes, you'll be feeling like your old self in no time.